A collection of 18 Native American portrait galvanos sold for a total of $64,560 at Heritage Auction’s recent Long Beach Expo. The works are widely regarded as Edward Warren Sawyer’s most significant contributions to medallic art. Sawyer trained with Hermon Atkins MacNeil, who designed the Standing Liberty quarter dollar, at the School of the Art Institute of Chicago in the mid-1890s. He later traveled to France where he studied at the Académie des Beaux Arts. By the end of his career, he would win the J. Sanford Saltus Medal for Medallic Art, which was awarded by American Numismatic Society in 1931. 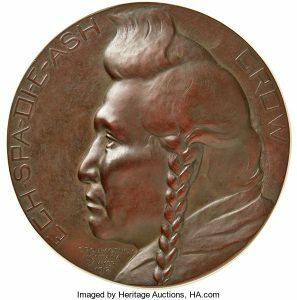 Sawyer’s portraits of Native Americans are among his most famous and long-lasting contributions to medallic art. While he featured prominent members of Native American tribes, such as the Apache and Navaho, he also featured children, squaws, and scouts. Using Sawyer’s models, the Medallic Art Company created bronze galvanos of his portraits in two sizes, 2-3/4-inch diameter and 5-inch. For those who may be unfamiliar, a galvano is a uniface rendering with the back typically filled with lead or another material to provide support. According to Heritage Auctions, 38 different subjects and 41 varieties known today, although it is unclear how many portraits Sawyer actually created. The galvanos can be found in museums around the world, including the American Numismatic Society, the Art Institute of Chicago, the Massachusetts Historical Society, the Musee d’Orsay in Paris, the Smithsonian Institution, the University of Reno, and the Whitney Western Art Museum. Privately-held galvanos are extremely rare, which is why the auction of 18 different medals caused such a buzz. The most prominent galvanos sold at auction included a 1904 portrait of Est-Zan-Lopa, a young Navajo girl whom Sawyer described as “a little girl blanket weaver” and a 1912 depiction of Ech-Spa-Di-E-Ash, a medicine man of the Crow Tribe. Each bronze galvano sold for $7,800 each.